We are living in an amazing era of rapid innovations. New technologies appear every single day, and all of them have a tremendous potential to transform the whole industries. Healthcare is no exception. One technology deserves particular attention from those who want to alter the way healthcare institutions work. This technology is called artificial intelligence. It can make diagnosing and designing treatment plans faster and more accurate, and it can automate routine tasks and lessen the burden on the doctors. But what is it? And how exactly can AI do this? Let’s dig deeper to find out. Let’s start with the basic understanding of what AI is to be on the same page afterward. AI is our attempt at mimicking the human mind’s cognitive functions (such as learning or problem solving) and putting them into algorithms. deep learning (akin to machine learning, yet applications powered by deep learning can learn longer chains of causal links). Applying AI to any industry comes with a number of benefits that can be grouped into three general categories. First, AI-powered solutions can cut costs. AI can automate the tasks earlier done by humans, so organizations will be able to save on labor costs or extra costs that are caused by human error. The automated tasks can be done faster and more accurately, which brings us to the second category – increased efficiency. Employees will not have to spend time doing routine tasks, thus they’ll focus on the ones that require human intelligence. And, once again, the more productive employees are, the more profit the organization can make. Thirdly, AI can power huge breakthroughs in the way the organizations (and whole industries) operate. Breakthroughs mean that you overcome a certain blind spot. In terms of healthcare, this could mean creating innovative drugs faster or diagnosing hard-to-spot diseases in their early stages – in several words, doing something that was not possible before. We’ve already tackled the key benefits of implementing AI-powered solutions that apply to any industry and any organization. Now, it is time for us to get acquainted with the 5 ways AI can alter healthcare institutions in particular. Spoiler alert: these artificial intelligence for healthcare use cases are not from the pages of farr out sci-fi novels. Virtual assistants are, in their essence, AI-powered chatbots that can answer questions regarding the person’s health or treatment instead of a living person. Using natural language processing, chatbots can make health checks through speech. As stated by Syneos Health Communications, 64% of patients are likely to opt for seeking help from virtual assistants. The perks are obvious: patients don’t have to disturb the doctor or go to a hospital to get a consultation while the burden on the doctors decreases. Chatbots can interact with hundreds of people simultaneously 24/7 – achieving this using only human intelligence is guaranteed to be expensive and cost-inefficient. In this field, the potential of AI is infinite. AI can analyze huge sets of different types of data and provide insights faster and more accurately than a human mind could ever do that. When it comes to diagnosing diseases, an AI-powered solution can analyze all the data from analyses and body scans, previous health records, and even relatives’ health records to draw conclusions on the diagnosis. Moreover, it can also design the most suitable treatment plan by analyzing multiple factors (allergies, the symptoms’ intensity, the results of tests, etc.) faster and accurately. Multiple studies have shown that these algorithms can perform at the same accuracy rate as human doctors or even outperform them. For instance, a Danish AI-powered solution analyzed the emergency calls and detected cardiac arrests in 93% of cases (against 73% success rate for human dispatchers). Automating routine tasks is, perhaps, the primary task of any software, especially powered by AI technologies. In healthcare, AI algorithms can automate an infinite number of tasks. For instance, they can prioritize patients in the ER by the urgency, analyze medical papers to design the best treatment plan possible in a particular case, etc. Automating creating and managing documentation could be the best thing to start the AI-powered revolution at a healthcare institution. For instance, an AI solution could transform voice into text using natural language processing in order to automate adding new health records or editing existing ones, writing prescriptions, ordering tests, etc. Using the data from wearable devices like wristbands, AI algorithms can analyze the heart rate and other health indicators in real time and provide insights on the data to the doctors and/or patients. Moreover, such a solution, if integrated with a virtual assistant, can give suggestions on how to keep well based on these insights. If the results of data analysis are visible only to the user, the main benefit is that he or she can stay healthy without having to contact a doctor. If the data is transmitted to the doctor, it allows him or her to understand the day-to-day patterns and needs of the patient better which increases the efficiency of treatment in the long run. Looking at body scans to determine the diagnosis is time-consuming, and it is rarely considered that this can be automated as well. Yet, with the help of machine learning, AI algorithms can learn to spot abnormalities in the scans, and they can do it times faster than humans. This can not only help in diagnostics but also in surgeries. Ultimately, image recognition and analysis can be a game changer even when there are no body scans to process. Patients could send the photos of rushes or other visible symptoms to an AI-powered virtual assistant. It could analyze them and diagnose the disease or determine the next steps (e.g., tests) the person has to take to get diagnosed. 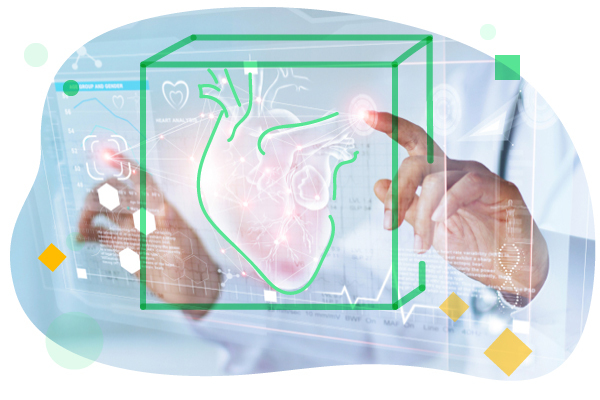 AI-powered applications are not just science fiction anymore – they already exist to make healthcare institutions and doctors more productive and more efficient. The variety of AI technologies can automate routine tasks and make diagnosing and planning treatment faster and more accurate. All in all, developing an AI-powered solution is a wise investment for any healthcare institution or healthcare-related startup as there are always workflows that can be automated and improved. In case you are ready to make your first step towards efficiency, drop us a line describing your needs, and we’ll help you start the AI-powered revolution.